Verticillium wilt (sometimes referred to as “vert” by experienced gardeners) is a disease caused by a fungus, Verticillium albo-atrum, which lives in the soil. It is often confused with fusarium wilt, bacterial canker, or early blight. Symptoms are similar in all these diseases. The fungus works its way up through the plant’s roots, clogging water-conducting tissue in the stem. It spreads a toxin that wilts and spots leaves and prevents water from reaching branches and leaves, starving the plant. Infected plants usually survive the season but are stunted. If they produce any fruit, it’s small and underdeveloped. What does verticillium wilt look like? Yellow spots appear on lower leaves, followed by brown veins. Leaves then turn brown and fall off. Infection pattern often resembles a V-shape. Symptoms progress up the stem. Plants may wilt during the day and recover at night. Interior of main stem (when split) shows discolored streaks about 10-12 inches above the soil line, the result of plugged water-conducting tissue. If cool conditions persist, the plant may die. When does verticillium wilt affect plants? The fungus thrives in cool temperatures and when soil is moist and not too warm (60-75ºF). It can attack at any stage in a tomato plant’s growth, but is most common when plant is producing fruit. How do verticillium wilt symptoms differ from symptoms of other diseases? When compared with fusarium wilt. Verticillium develops more slowly than fusarium wilt. Yellowing is less dramatic with verticillium and encircles the entire plant, while those infected with fusarium tend to show symptoms just on one side. Interior stem discoloration extends just 10-12 inches high in tomatoes infected with verticillium wilt, but all the way up the stem in those infected with fusarium wilt. When compared with early blight. Spots from early blight develop concentric circles; verticillium spots do not. When compared with bacterial canker. Verticillium symptoms encircle the entire plant. Those infected with bacterial canker tend to show symptoms on just one side. To slow the disease, use fertilizers lower in nitrogen and higher in potassium. How do you prevent the fungus? Rotate crops. The verticillium fungus can survive indefinitely in the soil. Plant tomatoes no more than once every four years in the same spot. Avoid planting other Solanaceous crops (potato, pepper, and eggplant) in the same area, too – they are susceptible to the fungus. 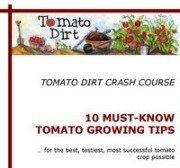 Choose disease-resistant tomato varieties. A “V” listed after the variety name on its label indicates its resistance to the verticillium fungus. 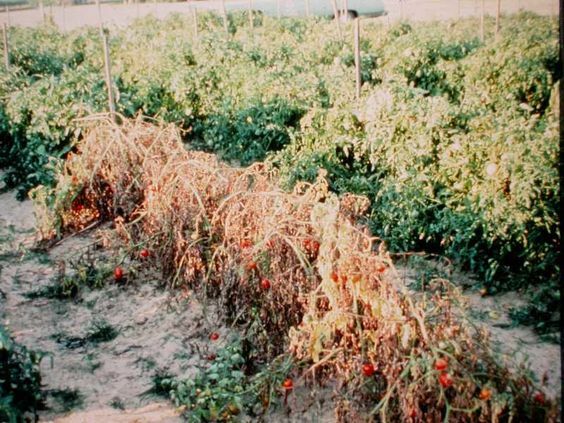 Verticillium wilt also attacks eggplant, okra, pepper, potato, strawberries, and 200+ other plants.